Two teams of three players attempt to shoot a ball through a shrinking goal in Blastball, a 3DS game with a Metroid-vibe making its debut during competition at the 2015 Nintendo World Championships. 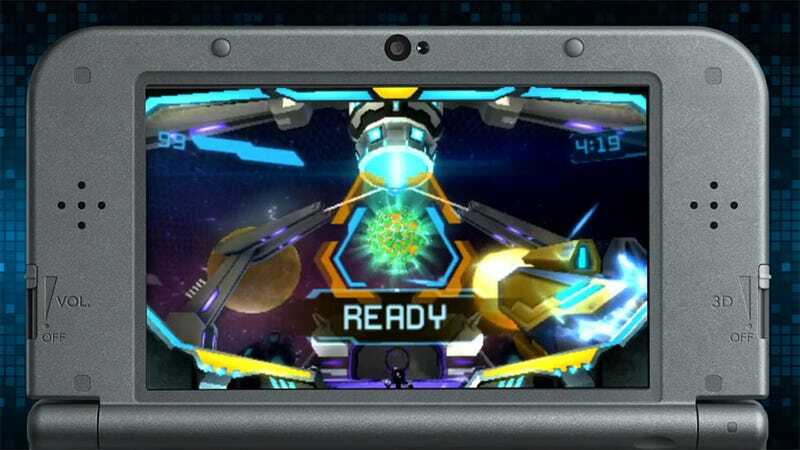 While the graphical style, the HUD and the single-weapon arm are giving off a real Metroid vibe, all we know about Blastball is that it runs on the Nintendo 3DS and it looks like a lot of fun while being played on stage at a major industry event. Players on both sides pilot mechs as they attempt to shoot a glowing ball into the other team’s goal. Score a point and the goal shrinks. The mechs can jump, collect power-ups and should they receive enough damage the pilots are forced to eject. In one round the ball became what looked like hot lava, damaging mechs that touched it. What a weird way to introduce a game. We should find out more about Blastball during Nintendo’s E3 presentation later this week.